Another busy day, leads to another easy, delicious and low calorie crock pot recipe. This Dijon Chicken Slow Cooker Recipe is simple, yet very filling, and tasty. 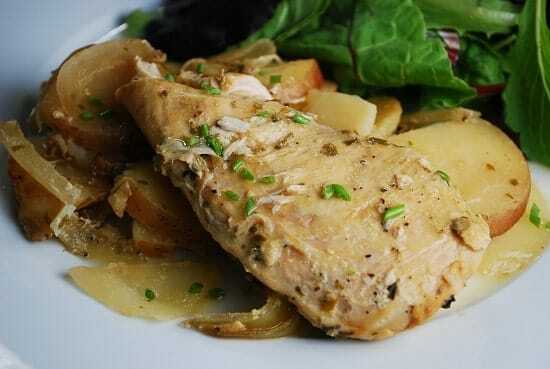 The mild chicken and potatoes complement the tangy Dijon mustard oh so perfectly. Each nicely sized serving is just 7 Points each, and it goes great paired with a fresh green salad. If you cook this on high, you may need to add some additional broth to keep it moist. You could also add in some other fresh vegetables to bulk it up even more – I’d suggest peas or asparagus. This slow cooker recipe has such minimal prep, so it’s great for a day when you just don’t have the time or energy to cook. But the end result looks and tastes like you’ve been in the kitchen all day. This is definitely a perfect Weight Watchers Crock Pot recipe to add to your repertoire. A delicious and original chicken crock pot recipe, this Dijon chicken is healthy, filling and low calorie. Great idea for an easy Weight Watchers dinner recipe! Place chicken breasts in crock pot and season with salt, pepper, and 1 tbsp oregano. Layer potatoes and onion slices over chicken breasts. In a medium sized bowl, whisk together broth, Dijon, lemon juice, lemon zest, and remaining oregano. Pour over chicken, potatoes and onions, and cook on low for 6-8 hours or high for 4-6 hours. Sprinkle fresh chopped chives over each serving. 2 lbs of potatoes? Are you sure, as that seems like a lot of carbs for 7 points. I enjoyed this meal. I used 15 oz of chicken broth because I was concerned it would dry out. I found the flavor perfect, not too lemony at all but maybe the extra chicken broth helped that. I’ll be saving this one! In regards to the calories, I calculate my data straight from the nutritional info posted on the packaging of each ingredient I use. Brands can vary pretty dramatically, so often those online recipe builders aren’t perfectly accurate. Where I probably saved on calories here is the chicken. I used Trader Joe’s Organic Chicken Breasts which are 120 calories for each 4oz serving. Hope that helps! And sorry it was too salty for you :(. I tend to be heavy handed with the salt sometimes. The nutrition facts don’t add up to the calories. Made this for dinner tonight, I used frozen chicken breasts and put it on high for 6 hours. It was WAY too lemony for my husband and son. My husband wouldn’t even finish it. :( Good basic idea though, just too much lemon. Would make again but cut the lemon WAY down (like, 1/2 of one lemon) and add lots of garlic and some thyme. Agree with taste being too lemony! I used juice of 1 1/2 lemons and even that was too much. I was hoping for more of the mustard flavor and despite adding more than the recipe called for, that flavor element was minimal. Will try again but will adjust these two ingredients and add some garlic as someone else suggested. Another great and easy recipe! It is very lemony. I guess I should have expected that with the juice of two lemons and all. he he. I made mine in a ceramic dutch oven in my oven on 250 for 4 hours. I also added a package of sliced mushrooms because I love them. My house smelled amazing while it cooked. The chicken came out nice and tender and prep was a piece of cake. So I am a health food junkie and I really love this blog. The recipes are awesome! But my family is not so much. It can be difficult to please them when I like to make meals with vegetables and healthy meats, but they would prefer a giant, fatty cheeseburger. This recipe was a definite exception though! It was flavorful and easy to make! I will definitely be making this for the family again soon! Okay, so I am a major health food junkie. Most of the time, my family thinks that the foods I eat couldn’t be more detestable. I am all about the fruits and vegetables, living with a family of carnivores! However, this recipe is one that I have to keep on hand. Everyone loved it!! It had really great flavor and it was really simple to make. I will definitley be making this one again soon!